…well actually she doesn’t have a name. She has no den, no enclosure to exercise in. She has no friends. Her life is entirely solitary. There are no vets to treat her pain. There is no grass to walk on. There are no trees to climb. There is nothing to relieve her mind-numbing boredom. Not even her food, which is the same corn gruel every single day. Until recently she had no one who cared about her. Nobody that would even give her a name. So why “happy” moon bear Monday? Because with your help this is about to change. This beautiful bear is one of 130 at Nanning Bear Farm that Animals Asia and our supporters will convert into the Nanning Bear Rescue Centre. Our staff are already finding ways to improve her life - changing her diet, and providing stimulation. Meanwhile plans are being drawn up to convert and develop dens and enclosures to give the bears the life they deserve. She will be given a name. She will have space to run and play and people who care about her – not just our incredible bear and vet teams but millions of animals lovers across the world. 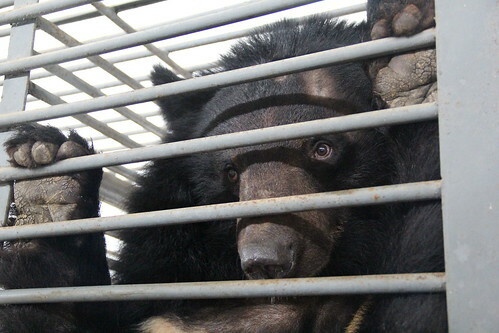 She will never know it but we’re certain her rescue will help inspire the release from cages of countless more bears. We’re not happy about how our bear friend has lived her life to date but we can be happy it’s about to change. Right now she has no understanding of how much better her life will be – but soon she will. She will realise that cruelty and indifference is being replaced with love. Please help us to help her and be proud to be a part of this rescue. For more information on how you can help – go to our Peace by Piece website.